Home / Lifestyle / Relationship Corner / RELATIONSHIP-ISSUES-AND-18PLUS / The Bedroom/S*x-room and s*x position is between you and your husband, Not Pastor! Wives, Husbands, take note. 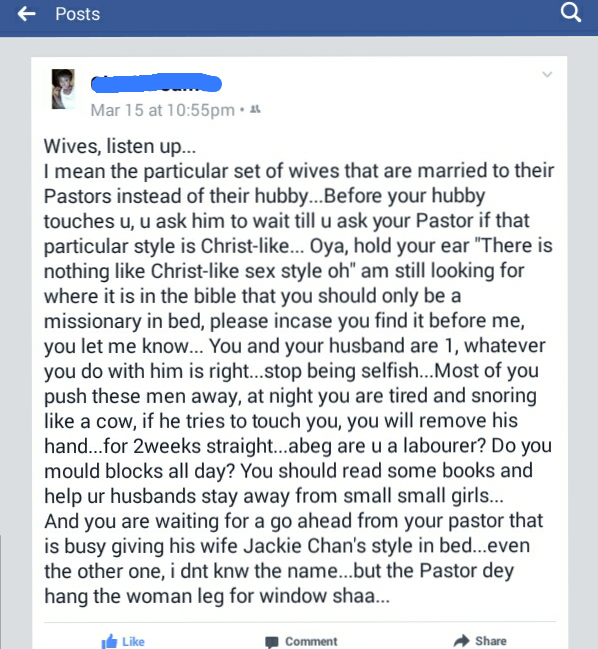 The Bedroom/S*x-room and s*x position is between you and your husband, Not Pastor! Wives, Husbands, take note. This message is to the married men and women out there, most especially the newly weds. When you agreed before God to be his wife or her husband, for better for worse, it means you two have become one, no second party. In as much as it sounded crazy, it passed across a very big message. I hear some women complaining to their fellow married women about how corrupt their husbands are, wanting to do s*x styles they see in foreign movies. Then the reply some of them get are; "God forbid" another would say " Mtchewwww, when you are not an ashawo". Well, I think it is high time I let you all know that s*x with your husband no matter the style is Legit, infact, it is your duty as the wife to research new s*x styles to be tried with him. Don't bore him by giving him lame excuses like "Its an ungodly style, let me ask the pastor, this and that", Or you lay like a log of wood while he does the whole action. Woman! the both of you are one, give him whatever style he wants, allow him quickies, it spices up your married life". Don't go complaining few years or months later about him cheating on you. Mr. Husband, what is your problem sef? why will you go one round and collapse like a bag of rice when its obvious she wants more. Then when she complains, you call her a sinner and report to your Pastor. Why do you keep trying the same old boring style with her and just one location (bedroom) every time? What happened to the kitchen, bathroom, car, dining table, parlor, stair case, or you still need permission from your pastor to ascertain the holiness of those areas. Then kindly don't complain if she falls prey to the seductive arms of some silly men out there.